No wonder a former Japanese Olympic snowboarder is so into otaku ("geek") culture. It seems there a whole group of snowboarding otaku, decked out in unabashedly nerdy attire. These photos are from the ski slops of Nagano Prefecture. 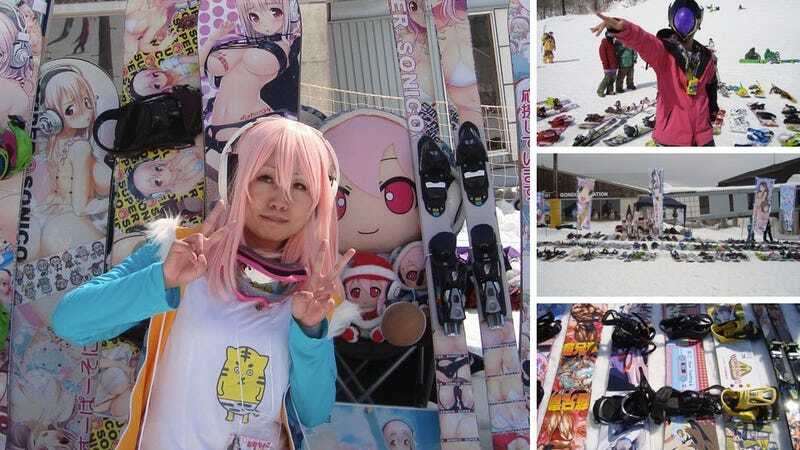 Besides the cosplaying snowboarders, there are geeked out snowboards, called "ita-board". They feature anime and video game characters. "Itasha" (痛車), or literally "painmobile", are cars covered in nerdy decals and stickers. "Itai" (痛い) refers to the pain inflicted on your wallet to trick out your equipment otaku-style. These are the snowboarding equivalent. The snowboarders didn't stop there. Some even dressed as characters, like Pikachu, as they hit the slopes. Super Sonico, Tokyo game developer Nitroplus' own in-house character, was on hand, too. Super Sonico releases songs and figurines in Japan. According to Japanese website 2ch News Flash VIP Blog, over 80 people participated in this event.